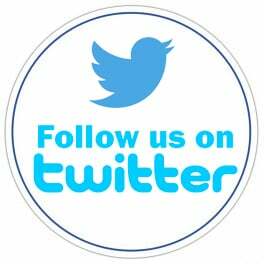 Law enforcement leaders know that one of the best ways to keep young people from committing crime later on is to make sure they have a foundation for success in their earliest years. By providing access to high-quality early education for kids today, we can see less crime and incarceration in the future while reaping millions in taxpayer savings and other economic benefits. PA's prisons are full of people serving time for serious and costly crimes. High school dropouts are more likely to end up in prison. 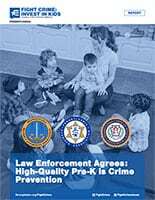 But it doesn't have to be that way: Providing at-risk kids with high-quality early learning programs can reduce crime and the resulting costs, other expenditures, and long-term negative impacts on society. 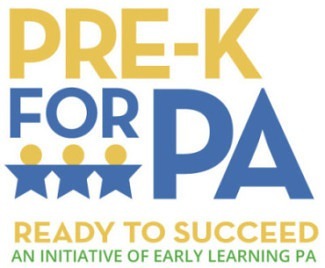 Pre-K Works, So Why Not PA? 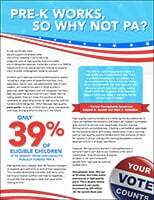 Pennsylvania ranks 18th out of 30 states that make public investments in high-quality pre-k. 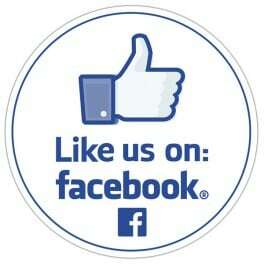 This is despite having increased its per capita investment by $30 million for the current fiscal year. Elementary School Principals Resoundingly Support Pre-K Investments details findings of a recent statewide survey of elementary school principals to better understand their perception of high-quality pre-k and its importance in building the foundation necessary for children to enter kindergarten ready to succeed. Nearly 99 percent agree that publicly funded, high-quality pre-k is an important tool for preparing children for kindergarten, particularly those at risk. 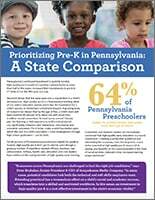 Pennsylvania Partnerships for Children (PPC) released a report that commends Pennsylvania for making increased state investments in publicly funded, high-quality pre-k but highlighting that the commonwealth is lagging behind many other states, including economic competitors, in its per capita investment.